All three research areas covered by the Chemnitz Automotive Institute (CATI) – internationalisation, process innovation / industry 4.0, and demographic change – also involve a significant impact on the current and future industrial workplace.One of the key issues relating to the sustainable innovative and competitive capabilities of domestic industry which is currently concerning economy and politics is the demand for and supply of well-trained experts. Late October / early November saw National Expert Week 2015 with the slogan ‘There’s more to Germany’, accompanied by numerous events in the region.One of these events was the first Saxony Expert Symposium, entitled ‘The Human Production Factor in Industrial Value Creation’ and held on 27 October in Chemnitz under the auspices of the Saxony State Ministry for Economic Affairs and Labour. 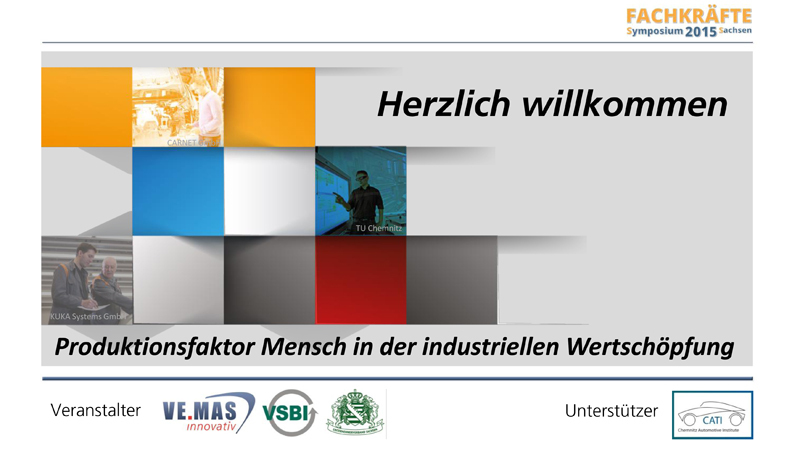 This event was hosted by VEMAS innovativ (the project initiator), Unternehmerverband Sachsen e. V. and Verband Sächsischer Bildungsinstitute e. V.The Chemnitz Automotive Institute (CATI) supported the event, which will return in 2016.‘The dialogue between companies, service providers and educational, further training and research institutions which this event aims to create is precisely the right way to turn a common concern into a common search for a solution’, according to Prof. Christoph Igel, a member of the Chemnitz Automotive Institute (CATI) Board of Directors. ← How will the VW crisis affect the ‘car state’ of Saxony?